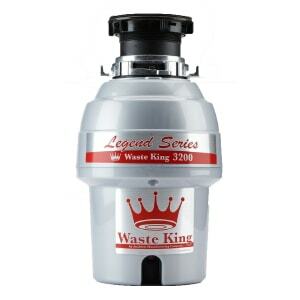 The Waste King Samurai L-3300 gets the nod for best budget garbage disposal. I am excited about this disposal because it offers a very capable garbage disposal at a very low price. If you are looking to get a disposal but don’t want to bother with all the frills, the L-3300 Legend is a great mid- to high-range product. It has slightly less power than the L-8000 model. While the Samurai L-3300 Legend may lack some extra power, many users I know are very positive about its capabilities. I especially like the modest price tag on this disposal. When considering food disposals, people usually use performance and noise reduction as good indicators as to how capable one might be. The 3/4 horsepower Waste King L-3300 Legend may not be the most powerful disposal on the market, but it comes in a close second with an estimated 2700 rpm output and a 3/4 horsepower motor. You can find plenty of 3/4 horsepower motors from other companies, and it is in no way a low horsepower rating for a garbage disposal. Don’t be too concerned that you will get an inferior product if you don’t pay top dollar for this disposal. If you don’t want to pay double for advanced options, you can settle for a quality, standard food disposal and still make a nice upgrade to your kitchen. Waste King has developed a variety of quality disposals for both commercial and residential use. The unbeatable warranty and quality stainless steel grinding components add to the appeal of this brand. 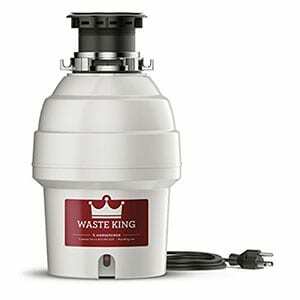 The Waste King disposals feature a noise-dampening case built out of nylon and glass. You should get no pitched growling and banging when you turn the Waste King Samurai L-3300 Legend on. The new L-3300 disposal works much better than its older, poorly insulated versions. The stainless steel grinding components also dampen any vibrations, so you have a much quieter atmosphere in the kitchen when cleaning up. The Waste King L-3300 Legend disposal has a hefty 3/4 horsepower motor. The L-3300 is designed to handle a lot of food waste and can power through many types of food debris. It has special impellers that reduce jamming as well. You can be sure that this disposal will endure some serious use. The Samurai L-3300 comes with a 10-year warranty that sets it apart from the competition. As this is a continuous feed type disposal and has a decent motor you can continuously dispose of wastes without any delay time. The L-3300 has plenty of power to handle a load of debris. The unique quick hookup system lets you install this system without any hurdles. It can be adapted to accommodate a dishwasher with a special kit. It comes with a three-foot length power cord which you can simply plugin in. The entire installation can often be done with common hand tools. If you are looking for a reliable, value for money disposal, Waste King 3300 is a good choice.